Have you recently purchased a computer for your kids and want to monitor their Internet activities? Once you’ve set the ground rules and told them your expectations, the next step is to find a monitoring software solution that will track their activities. Are your kids suddenly showing abnormal behavior such as shutting the laptop lid when you walk in or sudden flipping of screens to hide what they were doing? Again, have that long talk with them about what you expect and tell them that you are going to add monitoring software to monitor their suspicious behaviors. Monitoring software will allow you, the computer owner, to monitor keystrokes, emails sent/received, chat conversations, websites visited, applications used, webcam use, Internet searches and more. Most products include the ability to capture screenshots of their desktops so you can see exactly what they are doing. Of course, not all spy software is created equal. We’ve tested the best in the industry and have listed our top recommendations below. Check out each product’s benefits and make the decision based on your needs and what you can afford. Need to monitor employees at your business? We strongly recommend looking at our best business employee monitoring software page to get the best in monitoring software specifically made for employee monitoring. Claim an Exclusive 10% Instant Discount Today! Has been our #1 diamond award recommendation since 2012. Exclusive instant 10% off regular already discounted price. Run in complete undetectable stealth mode (optional). Real-time desktop screen viewing, monitoring and control access. Captures screenshots to see EXACTLY what is being seen on their screen. Supports Windows NT4, 200x, XP, Vista, 7, 8 and 10 (32-bit or 64-bit). Filtering settings to filter out unwanted websites and software. SpyAgent has been a continued #1 Platinum award winner since 2013 on Top Five Advisor and continues to set the bar higher and higher with new features and compatibility upgrades that have remained free of charge to all existing SpyAgent 8.x owners. Recently, they added remote log viewing capabilities and have upgraded the software to make it fully Windows 10 (all editions) compatible. Upgrading: SpyAgent includes minor revision upgrades free of charge. When SpyAgent upgraded from 8.1 to 8.5, the upgrade was free for all 8.1 buyers. Any upgrade from 8.x to 8.x is free. If they release a major new version, an upgrade is possible at 50% pricing. The last time a major version was released was July 1st, 2013, over 2 years ago. This means that customers have enjoyed free upgrades for well over two years already. Lifetime Upgrades: A customer can get reassurance on their software by purchasing the optional “Lifetime Upgrade Insurance” option for $29.95. Other than that, you will still get free major version upgrades if one is released a year after your purchase. EXCLUSIVE 3 PC Upgrade: Instead of charging you for every PC on a discounted volume tier, SpyAgent has offered all Top Five Advisor readers a discounted 3 PC license and has allowed a 10% discount on that package as well. Total price is just $80.95, only $18 more than the 1PC license. Your price per PC is just $26.98, an incredible deal! 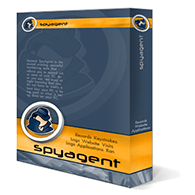 Features: SpyAgent includes all of the features we looked for in this review and determined that SpyAgent has more features than every other product on the market. 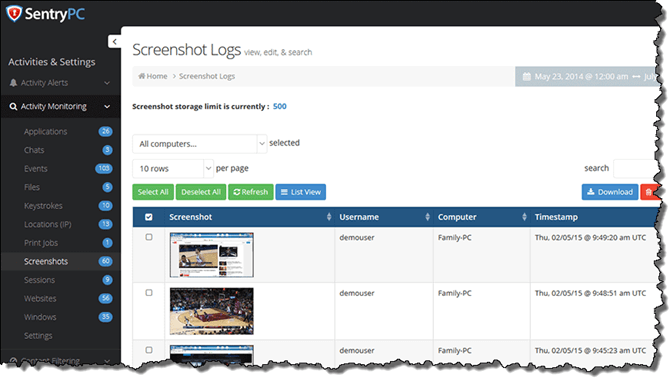 Capture screenshots on your scheduling, flexible log storage options, monitor website visits and searches, monitor keystrokes, monitor social media, track software used, real-time monitoring and so much more. See our full SpyAgent review for a breakdown. Blocking and Filtering: You will have hot-key protection with full remote access capabilities. Filter and block websites, applications, chats and enable instant email notifications should a user of the computer do something you want to be notified about. One awesome configuration is the ability to block specific keyword searches from being performed on the computer. Security Protection: Set up a custom hot key sequence to protect the configuration screen. Optionally run SpyAgent in stealth that is undetectable to the user, it won’t even show up in the task manager, won’t show up in the registry and won’t appear in Windows startup configuration screens. SpyAgent detects and disables spyware detectors. Configure PC lockdown settings to prevent the computer from being used during specific times. Configure SpyAgent to auto-uninstall after a set amount of time or use the remote uninstall feature to remove it remotely. Awesome Logging: SpyAgent generates several log reports including popular activities and individual log summaries. Generate top 10 reports for email sending and receiving, applications used, websites users, files used, online searches, file transfers and a few more. NEW FEATURES: Now you can access your SpyAgent logs and settings in the cloud with SpyAgent 8.5. Log in remotely and see what users are up to, configure the settings and have logs sent to you via email on-demand. This new cloud viewing option even allows remote uninstalling of the software. Take advantage of Spytech’s offer to you on Top Five Advisor and claim the best in monitoring software for use on 3 PCs for just $80.95. Click the red button below to order directly from Spytech. Use coupon: TAKE10. This coupon is auto-included on the red buttons below for your convenience and will automatically save you 10% off their regular retail pricing. A monitoring software fully in the Internet cloud. 24/7 remote access to all captured logs and data in the cloud. Records all activities, enables content filtering and allows usage scheduling. Free upgrades and support for the lifetime of your subscription. Detailed reports with searching and sorting capabilities. Setup instant alerts to get notified when questionable activity has occurred. Fantastic remote viewing website. Easy to use with attention to detail. Easy user management controls all PCs and users under one account. If you like SpyAgent’s new remote viewing of logs and settings, you are going to love SentryPC. This software was built from the ground up to be used in the cloud to make it as easy and painless as possible to monitor a computer. Licensing: SentryPC is a software as a service platform that requires renewal after one year. Similar to most SAAS software agreements, you will get unlimited technical support and software upgrades during the duration of your purchase. One PC Monitoring: $59.95 per year. Each Additional License: $19.95 per year. Monitoring 3 PCs in your home is $99.85. SentryPC is cheaper than SpyAgent in every regard except for those taking advantage of our SpyAgent 3 PC exclusive offer. If you are needing to monitor 1, 2, or 4+, SentryPC is cheaper. The only caveat here is SentryPC requires renewal for continued use after one year. Since you are utilizing SentryPC servers 100% of the time for capturing, recording and viewing of computer usage, we think this is fair. Features: SentryPC is an awesome solution for parents wanting to monitor their children’s Internet use and computer activities. SentryPC goes one step further than SpyAgent by allowing full activity log and screenshot viewing in the cloud. This allows you to look at the PC activities from anywhere in the world that has access to the Internet. We loved their backend system, it is very intuitive with full searching and filtering to discover the data you are looking for. Look at logs on a smartphone, tablet or on a desktop and everything works extremely well. If you want to monitor multiple computers, you will still use a single account and simply switch from computer to computer. Simple! SentryPC has all of the monitoring features that parents look for. For a full breakdown of all of the features included, be sure to take a look at our SentryPC review. Content Filtering: Easily filter and block access to applications, chat software and websites (including by category or user-defined). Beyond filtering and blocking, you can set up altert notifications by email and configure security options by the desktop user. Time Management: Specify the exact times and days that you want your kids and desktop users to have access to the computer. Configure a maximum time allowed that prevents usage of the computer after x hours that you specify. Deployment and Removal: Easily deploy the software via email, network or physically. SentryPC allows you to create a custom exe file for easy deployment. Just get that file launched on the target computer that you own and everything else is taken care of remotely in the cloud, including configuration of settings. Removing the software is also done remotely from the cloud. 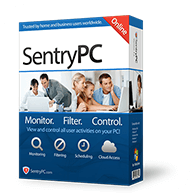 SentryPC is fully compatible with Windows 10, Windows 8, Windows 7, Vista, XP, NT, 200x. Save 10% off Realtime-Spy, Realtime-Spy Plus, Realtime-Spy Mac or Realtime-Spy Mac Plus editions. No annual renewals. Free minor upgrades. 1 year major version upgrades. Compatible with Windows 10, 8, 7, XP, Vista and Mac OS X 10.6+. 24/7 remote viewing with real-time monitoring access. Log and record multiple PCs from one remote location and account. Offers a Plus version for 2 Win/Mac licenses + additional 500 screenshots. 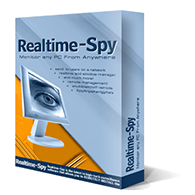 Order Realtime-Spy 1 Windows PC – $71.95 one time purchase. Order Realtime-Spy 1 Mac OS X 10.6+ – $71.95 one time purchase. All pricing we list here includes an exclusive 10% off discount for Top Five Advisor visitors. The coupon code TAKE10 is automatically included when you click the link to order. All order links go to Spytech’s shopping cart for instant purchase convenience. Supports mobile: Android 2.1+, Blackberry OS 5.0 - 7.1 and iPhone iOS 6 - 8.4. Get unlimited updates for life for $29.95 additional fee at checkout. Various features depending on the platform you want to monitor. Live chat and toll-free telephone technical support. View logs and data remotely via their web interface. Sponsors the National Parent Teacher Organization. 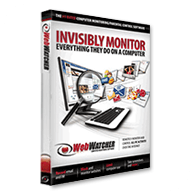 WebWatcher is a much more expensive monitoring software product but they support the most operating systems and platforms out of all the other products we list on this best monitoring software page. If you need to monitor activities on Windows PCs, Mac, Android, iPhone/iPad or on a BlackBerry, WebWatcher has you covered. Features: WebWatcher has a powerful feature comparison chart so that buyers can see what features they can expect on the platform they want to install it on. 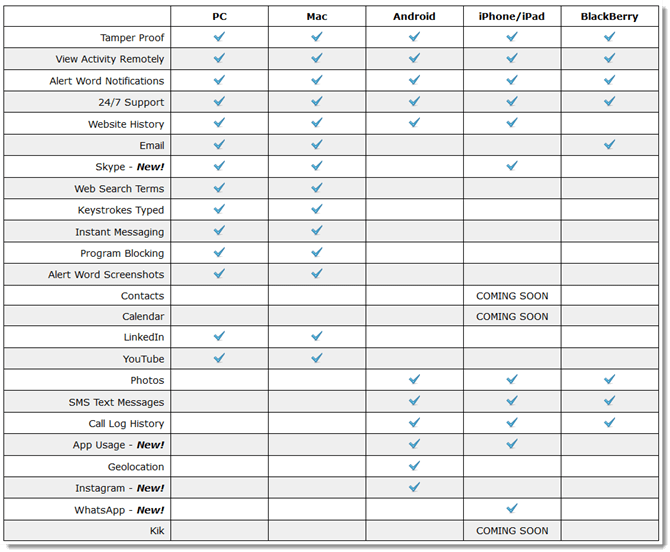 We’ve included a screenshot of this comparison chart for your convenience. As you can see, WebWatcher will monitor website history on almost every platform. Beyond that, the Windows and Mac versions will record all of the activities you’d expect including emails, Skype, keystrokes, web searches and more. However, overall, you might find their feature set lacking compared to their competition. Regardless, we’ve included WebWatcher here for those that want to monitor Android, iOS or BackBerry devices. Licensing: WebWatcher is a single-purchase product that does not require renewal after a specified time. We were not able to figure out what their fee is to upgrade the software if a new major version is released. Each $99.95 license will cover usage on 1 device. If you need to monitor more than 1, expect to pay full price for each additional computer or handheld. If desired, purchase their $29.95 lifetime upgrade insurance program to ensure compatibility with future operating systems and to get their latest features. What do you recommend for MAC OS X? We recommend Realtime-Spy for Mac. This software is fully Mac compatible and allows you to remotely view logs and data over the Internet. You won't have to secretly log on to that computer to see what was recorded, instead, log on to their website and view everything at any time from anywhere, as long as you have Internet. What's the difference between SpyAgent and SentryPC? SpyAgent was built to log everything locally. Spytech has recently added remote configuration and alert abilities but it you want a product that was built for the cloud (remote access), we'd highly recommend SentryPC. Other than that, the features are very similar. I want to monitor employees at my office. What do you recommend? It's not listed here but we'd recommend NetVizor. This software allows you to monitor employees and all of the data is maintained on your local network. If you are interested in employee monitoring software, we'd highly recommend visiting our best employee monitoring software page for all choices and recommendations. We strongly recommend choosing from the above best monitoring software, however, we realize that certain products may be a better fit for some of our readers. Below, you will find other monitoring software products that we’ve reviewed. REFOG Personal Monitor Review – Not compatible with Windows 10 at the time of this review. Priced at $79.95 for 1 computer or $99.95 for 3 computers. It offers email delivery, app filters, file tracking, call recording, alarm keywords, keylogging, screenshots, social network monitoring, website visit logs, program activity and computer activities. Elite Keylogger Review – Owned by widestep, their domain is currently on a malware domain list and blocked by the popular uBlock advertising blocker. They offer their Elite Keylogger monitoring software for Mac and Windows operating systems. Pricing is $49 on Mac and $79 on Windows for one license. Monitor 2 computers for $69 (Mac) or $129 (Windows). SoftActivity Review – Softactivity Keylogger is $49.95 for one computer or $99.99 for three under their family license. Has full support for Windows 10 and older Windows operating systems. No Mac support. SniperSpy Review – No support for Windows 10 at the time of this review. Supports Windows and Mac operating systems through OS X 10.9. SniperSpy is a software as a service product that offers a 6 month and 1 year plan. The one year plan is $79.95 and supports 1 computer.